NETWORK UPDATE: WORLD SERIES GAME 6 adjusted up to 3.5 in final numbers. THE VOICE and MARRY ME swapped 0.1s, the former up and the latter down. Both NCIS and PERSON OF INTEREST rose 0.1, tying the latter with CHICAGO FIRE for the 10PM lead. THE FLASH gained back 0.1 of the morning’s loss. SONS OF ANARCHY (FX) lost 0.28 from last week, but still led Tuesday cable at 1.98. 19 KIDS AND COUNTING (TLC) had a huge week–anyone know why? because it was the show’s wedding episode–rising 0.53 from last week to 1.50, almost enough to challenge SONS. Last night marked the start of the NBA BASKETBALL season, and TNT’s games were at 1.27/1.03; interestingly, it was the later game that was the higher rated, although it didn’t start until almost 10:45PM on the east coast, likely reflecting the continuing appeal of even a faded LA Lakers team. An ESPN documentary about Brian Bosworth also did quite well at 0.77. On Comedy Central, TOSH.0 was steady at 0.76, and BRICKLEBERRY rose 0.06 to 0.48. INK MASTER (Spike) was down 0.02 to 0.76, BAD GIRLS CLUB (Oxygen) climbed 0.19 to 0.60, and FACE OFF (Syfy) gained 0.04 to 0.58. On USA, CHRISLEY KNOWS BEST (down 0.08 from last week’s 10PM episode to 0.53) was the lead-in to the premiere of the new BENCHED, which debuted at an OK 0.39. 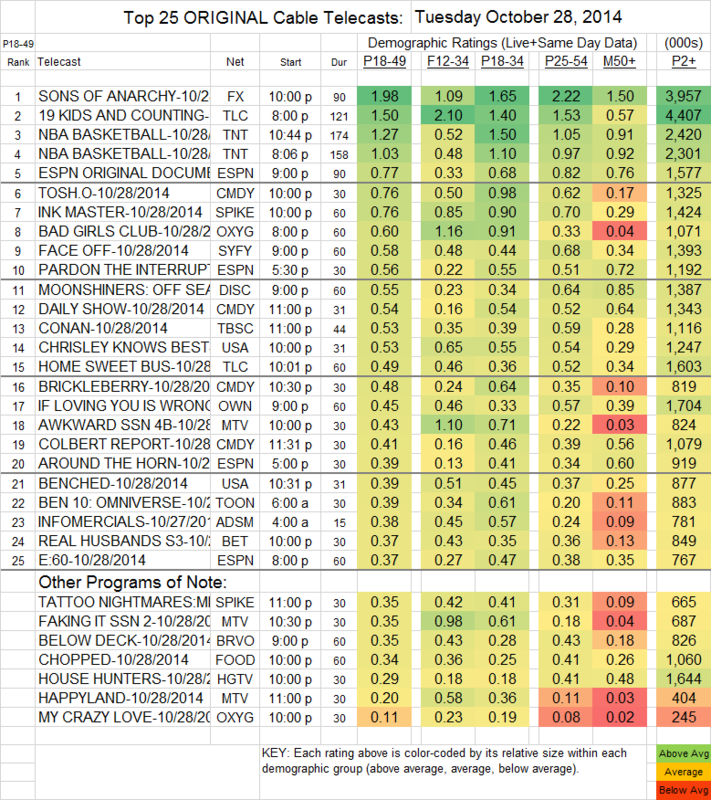 On MTV, AWKWARD lost 0.14 to 0.43, FAKING IT was down a single tick to 0.35, and HAPPYLAND rose 0.08 to 0.20. IF LOVING YOU IS WRONG (OWN) fell 0.04 to 0.45. REAL HUSBANDS (BET) dropped 0.17 to 0.37. On Bravo, BELOW DECK dropped 0.21 to 0.35, but PEOPLE’S COUCH gained 0.03 to 0.26. And for those keeping track of its ratings path, Adult Swim’s 4AM INFORMERCIALS climbed 0.04 to 0.38, the 23rd highest cable original of the day.